We are excited to announce that Stephanie has joined the Lindley Clothing team! Stephanie spent the last 8 years selling women’s clothing at Ann Taylor and says the switch to men’s clothing hasn’t been hard. “Women tend to browse and shop around for the best deal, where men shop with a purpose,” said Stephanie. “Men tend to come into the store looking for something specific, a suit, or a new sport coat.” But one thing stays true whether it is women or men, they all want to look and feel good in what they are wearing. The move to Lindley Clothing team was coming full circle, in a way, for Stephanie. Decades ago, her grandfather, Selmer, sold two clothing lines to Lindley Clothing – Puritan Clothing and Lord Jeff –and the families have been lifelong friends. She was looking forward to her next career move when John Lindley approached her about joining the Lindley team, and she knew it would be good fit for her. Stephanie is a great addition to our sales team which includes Joe, Rick and Marlene. Each of them is experienced in finding the right product and fit for our customers. We know that a standard fit off the rack doesn’t fit most, and we work together with you and our full-time tailors to get a custom fit that looks and feels great on you! Stephanie encourages men who have never been in the store to come in and see what makes Lindley Clothing different. We carry a wide range of men’s clothing options, from casual to formal, at various price points to meet the needs of everyone. You can stock up on Husker gear and business attire in one trip! Our loyal customers come back to Lindley Clothing because they value the personalized service that we provide to each of our customers. Stephanie is excited about the opportunity to share her expertise and enthusiasm for fashion with our customers! Stephanie is married to her husband Todd and they have two children, Teddy and Olivia. She is a runner and enjoys biking tennis, and outdoor activities. Get the Lindley Look even on game day! Robbie is shown in a cotton acrylic NU sweater from Hillflint with Fidelity blue jeans. Robbie has been a loyal Lindley Clothing customer since moving to Omaha from Chicago. He works in real estate development and is married with four kids. 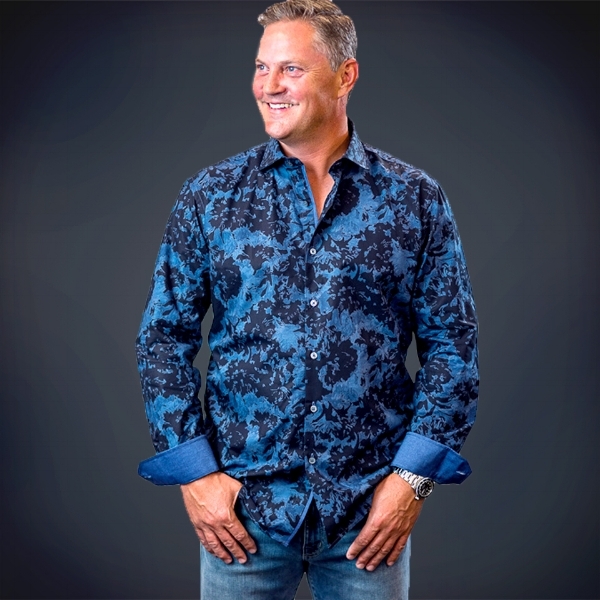 Real Estate Developer Robbie goes from business to casual in this floral shirt from Bugatchi and Fidelity blue jeans. It’s better to buy a new suit than rent a tuxedo. Whether its your wedding, or another special occasion, we want to help you look and feel like the best-dressed in the room, and you can do that in a suit from Lindley Clothing. Stop in today and let us help you choose the perfect suit for your special event – and beyond! According to The Knot, June is the most popular month to have a wedding, followed by August, September and October. This has us thinking about outfitting grooms and groomsmen for the big day. Tuxedos have been traditional wear for the groom and his groomsmen, but in recent years we’ve seen an increasing number of wedding parties opting for suits over tuxedos. We have also seen a shift from traditional suits for professional purposes to a wide variety of styles, patterns and colors. At Lindley Clothing, we carry a large selection of suits for any occasion, and we encourage you to come browse. Weddings and fashion have changed over the years, and more and more grooms are choosing suits over more formal tuxedos for themselves and their wedding parties. For many it can be a style choice, but for some it comes down to practicality. There’s been a shift from renting tuxes to purchasing suits that can be worn multiple times. Suits also allow for more leeway when it comes to customizing to fit personal taste and styles. The versatility of a suit and the ability to wear a variety of shirt styles, colors and patterns are making them a more popular choice. We are pleased to announce that Lindley Clothing has entered a partnership with Nick Bahe, former Creighton University and University of Kansas basketball player, and current media personality. Since 2013, Mr. Bahe has hosted a radio talkshow, Game Time, which has become one of the top rated local talk shows in the country. Nick is also in his third year with Fox Sports 1 as a college basketball analyst, calling games for the Big East. "As a father, businessman, and member of our community we think that Nick perfectly reflects our values at Lindley Clothing," said John Lindley, Owner. "Nick is great voice for the Omaha community and we are thrilled to help him look and feel his best when he gets in front of the camera." Mr. Bahe has had quite the year and will be joining the Fox Sports 1 team courtside at the Big East Tournament this year. Tune in and check out the stylish Nick Bahe. For over 81 years we've been helping men look their best. That's why we were voted the best Men's Clothing shop in Omaha. Stop by to check out the latest and greatest looks. Ladies, mark your calendar – November 29 is YOUR day at Lindley Clothing! Our annual Ladies Day is back, Tuesday, November 29. Shop from 9 am to 7 pm and save 20% on your total purchase! We have something for all the men on your holiday list – everything from business casual to sportswear and flannels. We have a huge selection of shoes and this year’s popular denim items including Fidelity and 34 Heritage. Fill the stockings with belts, hats and socks! We are ready to help you find the perfect gift for your husband, son, father and brother. We invite you to enjoy coffee, wine and treats while you shop or wait for your free gift-wrapping! Lindley Clothing has been Omaha’s premier provider of men’s fashion for more than 80 years, and we were once again voted Best of Omaha for 2017 by our customers! We offer the latest styles and top names in fashion ranging from casual to suits. The first 12 ladies in the door on Tuesday, November 29 will receive a door prize, so make plans now with your favorite ladies- we look forward to seeing you on Ladies Day! Serving Omaha for More than 80 years. 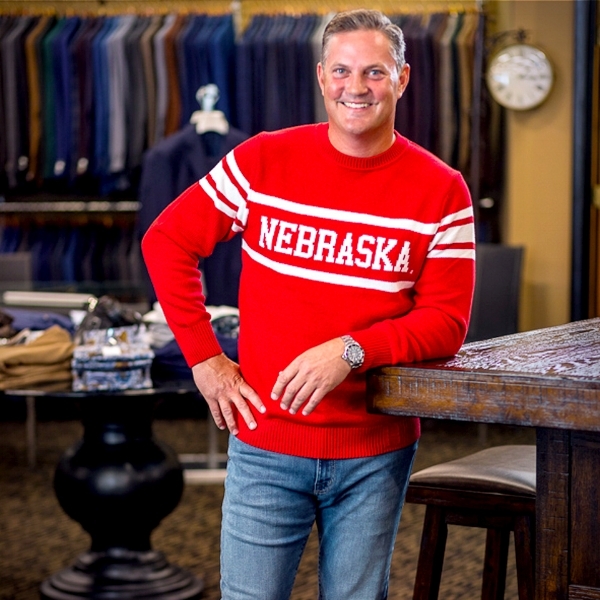 The Lindley name has been synonymous with men’s fine clothing for years in Omaha. More than 80 years in fact. Jack Lindley opened Lindley Clothing in Wahoo, NE in 1935, and the business was moved to downtown Millard in 1960 by Jack’s son Butch. John Lindley joined the business that his grandfather Jack started in 1979, and eventually bought the business from his uncle Butch in 1988. John made a decision to move the business west to 132nd and Dodge St. in order to move with the population growth. It was a decision John has never regretted. Business has tripled since the move, and John believes he could not have picked a more perfect location to serve his customers. “Service is our top priority, and we do it very well,” says John. Lindley’s customer list is nearly 5,000, and many of those are regular customers. “We know our clients by name, and we know what they like.” This is particularly handy when spouses come to the store, looking for the perfect gift. John credits many dedicated employees for contributing to the company’s success, including his tailor who has been Lindley’s tailor for 35 years, and has helped build trust with clients. Good tailoring is hard to find, and nearly impossible at big department stores. Lindley clients have come to trust his work, which is often requested at the last minute! The business has evolved over the years in order to meet the needs of customers. Styles have changed over the years, and today business suits are the main driver to get customers in the door. John is encouraged more and more young professionals have become clients, and he appreciates that young people today recognize the importance of dressing well in the business world. The Lindley name is known for fine suits, but nearly 50% of their business is sportswear. Customers are often surprised when they visit the store and learn they can be dressed from head to toe, including shoes! You may no longer be able to purchase a tie for $5 like you could when the business opened, but the friendly service and commitment to customers that the company was built on has not changed. Stop by this weekend and take advantage of our Spring Sale! Starting April 7th, we welcome everyone to come take advantage of our spring sale! Save on Michael Kors, Calvin Klein, St. Croix, Bugatchi, Bobby Jones, Scott Barber, Jack Victor and more. Dressing for success actually might make you more successful. An article published earlier this month in the Wall Street Journal recaps the research—and we agree with the results. Read the full article at http://www.wsj.com/articles/why-dressing-for-success-leads-to-success-1456110340. And if you need a new suit, the team at Lindley Clothing is ready to get you setup for success.